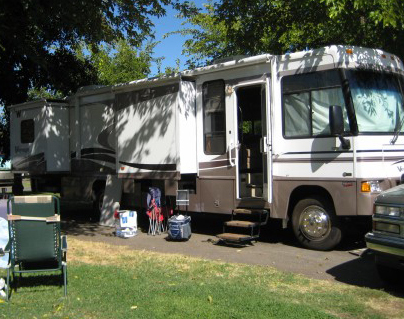 He’s a 2005 Winnebago Voyage 35A. We got him used in July of 2007 with 8,800 miles. Here’s the floorplan so you can get an idea of what we have to work with. We can carry 75 gallons of fuel, 86 gallons of fresh water, 80 gallons each of grey and black water. The generator is 5,500 watts which is enough to run both air conditioners and the microwave all at the same time. If we pull off into the desert with everything full, and we are conservative, we should be able to go two weeks without needing any services. probably a little tight at times, and you both need to be Best Friends! But you two are living the dream.